Înlocuiți un motor mai vechi? • Solution 1: Replacement engine that fits to your existing saildrive leg and GRP moulding. • Solution 2: Replacement Saildrive unit that fits your existing GRP moulding. With either of these solutions we offer our unique service of designing and manufacturing “Special Saildrive Feet” to match the existing GRP moulding. The one common factor with all Saildrives is the leg and rubber diaphragm – all a very similar size. We offer the special feet that bolt to our engine and your existing locations in your GRP moulding. b) Which specific yacht was the engine installed in? Basically these are hundreds of different Saildrive Feet and we need your specific details and dimensions; a few photographs are really helpful. Most engine mountings use coach bolts into wood (fibre glassed into the base moulding), but not always. The system works like this: You need a copy of our ‘Special Saildrive Feet Form’ that we can either post to you, or you can download from our website and print. You now need a good tape measure and a couple of straight edges so that you can take the necessary measurements from your boat for us to design and manufacture your Special Saildrive Feet. We just need to accurately establish where the engine bearers are relative to the saildrive leg, and measuring is always much easier with the old engine removed, but this is only possible with your yacht out of the water. 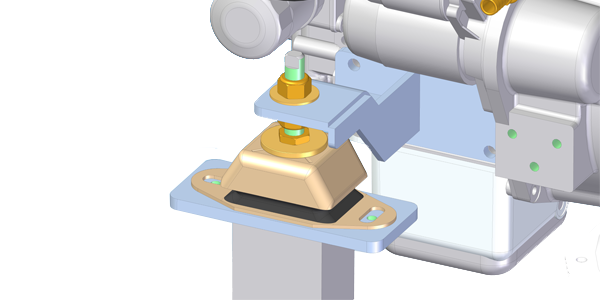 All measurements are taken from the saildrive leg centre (the datum). As soon as possible – please send us the ‘Special Saildrive Feet Form’ with all your measurements clearly legible, either by post, fax or email. Please include your name and contact details on the form. We use the dimensions that you have given us to create a drawing of your special saildrive feet, and we will send it to you for checking and signing. When you return the drawing to us that have you signed off as correct, we will manufacture the ‘Special Saildrive Feet’ exactly to the dimensions that are on the drawing. If you find a problem then contact us with the correct measurements and we will revise the drawing until it is correct. Where possible we will fit them to the engine. If they will not fit in the engine shipping skid we will send the feet loose and fit standard feet. All bolts will be provided to fit the special feet to the engine. You will probably need to drill new holes for the flexible mountings. f the flexible mountings are wider than your engine bearers, Beta Marine can supply solid mounting pads that fit between the flexible mountings and your engine bearers. If you have any doubts please speak to Beta Marine for help. Please make a note of any problem areas that you may think Beta should know about (e.g. head room or sump restrictions).